An employer may sponsor a foreign born employee via Labor Certification when the employer can show to the Department of Labor that he could not find an American to fill the respective position. The employer has to pay the foreign born the same he would pay an American for that respective position. There are Extraordinary Ability people who can apply on their own without an employer and without Labor Certifications, like famous musicians, entertainers, or famous athletes that can show their celebrity status or Olympic medals. 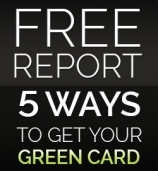 Individual EB-5: This green card category is employment based – it allows investors of $500,000 to $1,000,000 to obtain a green card by proving the amount of investment and the creation of 10 jobs for American employees. The $500,000 investment is required for geographical areas with high unemployment. The $1,000,000 is permitted in any area of the USA. Regional Center EB-5: As opposed to the above where the investor has to oversee and run the company where the investment was done, there are also opportunities for investment of $500,000 in Regional Centers approved by USCIS. There are about 200 Regional Centers; some are more experienced in getting the permanent green cards than others that are newer. When investment takes place in a Regional Center the investor doesn’t have to get involved in the day-to-day operations and will obtain his green card based on the formula used by the Regional Center for job creation. VM Gokea Law Group PLLC. developed a reputation with small and mid-size companies that need the services of foreign employees. These companies understand the benefits of hiring bright individuals from around the world when local talent is not easily available. With our help our clients develop a business immigration strategy that can be implemented when they need to hire new talent from abroad.